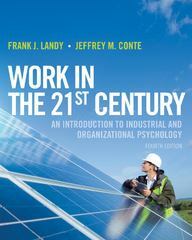 Work in the 21st Century 4 Edition This book retains the accessibility of the previous editions while incorporating the latest research findings, and updated organizational applications of the principles of I-O psychology. The scientist-practitioner model continues to be used as the philosophical cornerstone of the textbook. The writing continues to be topical, readable, and interesting. Furthermore, the text includes additional consideration of technological change and the concomitant change in the reality of work, as well as keeps and reinforces the systems approach whenever possible, stressing the interplay among different I-O psychology variables and constructs.